Seriously. I love to cook but life is busy. This is almost the only place I look for recipes any more. Every single thing I’ve made- and I’ve made a lot!- has been excellent. I love that new recipes are added all the time. I love the grocery list. These are now my standbys. Best app investment I’ve made! Highly recommended! This is the easiest to use, and best app out there for great recipes, picture directions, and shopping list downloads. Super recipes for Whole 30, Paleo, and Instant Pot! They have frequent updates with new recipes and blogs. Simply love it! I like her recipes overall. The app is relatively easy to use, but there are some bugs, and there’s not many recipes. It would be nice to search by prep method (aka instant pot). The shopping list adds things twice and sometimes after I check off an ingredient, the next time I open the app it is back on the list. There is no way to schedule meals for the week. Once ingredient is checked off list, I would t remember which recipes I planned on. There is a monthly meal plan but I can’t customize it. Servings sizes cannot be adjusted... not really worth the money overall. I love the recipes and a lot of the features in this app are so great! However I wish the shopping list could organize ingredients by section. Like keeping produce, herbs, meat, etc together by category instead of the order of being added to the list would make shopping so much less frustrating. 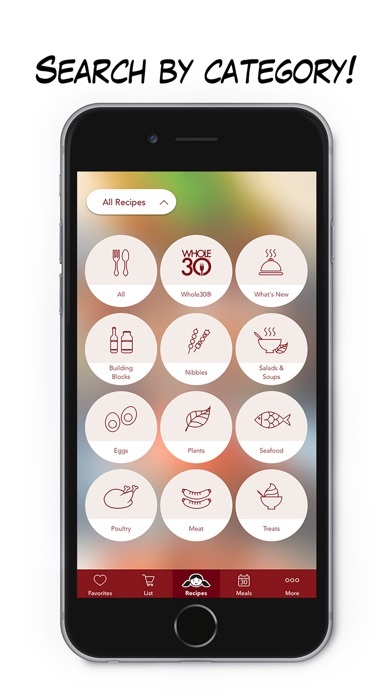 We use this app almost daily, it makes the recipes (which we love) much more accessible. But now it’s stopped working after the latest iPhone update 😢 help! I am enjoying this app. I love every recipe I have tried. Access favorite recipes the store! I love my cookbook at home and this app has been a fantastic supplement. I use it for accessing my recipes when I am away from home but want to work on a grocery list or I am at the store and want to check a recipe. Very happy with how easy it is to use and the search function. I have followed NomNomPaleo for the past 2-3 years and have loved having this app to quickly look up recipes to follow in the kitchen. I've appreciated the quick grocery list to make it easier for me to prep for these delicious and healthy meals and the step-by-step images have been super helpful. I also love following Michelle on Insta for NomNomPaleo and watch her Facebook Live videos when she makes her recipes and answers questions. Thanks!!! The only paid app I use more is my adding machine (for work)! What happened to all the recipients?? I was looking for the chili instant pot dish and notice that not many recipes are left in the app. Now i need to buy the book to get the recipient. Please bring back the recipes and I’ll change my review. All the necessary components of a recipe and also helpful pictures, if desired. Everything NomNom-related is awesome. This app is especially cool because you can add needed ingredients to your shopping list for easy meal prep organization. The calendar of daily recipes makes planning a whole30 or otherwise intense meal prep/planning experience much easier! Definitely a must have app! I cook from the app at least twice a week and look through it for ideas every day. The format makes cooking lots of fun and saving favorites is such a plus. I hope they keep adding new recipes! Used to LOVE this app but so many recipes were taken off. Now you need to go to the blog to grab a recipe. Why not offer same recipes that are on the blog in the app? A friend recommended this app to me while I was doing the Whole30. Let me tell you, this app makes clean eating a piece of cake... or maybe a piece of baked chicken is a more appropriate term. 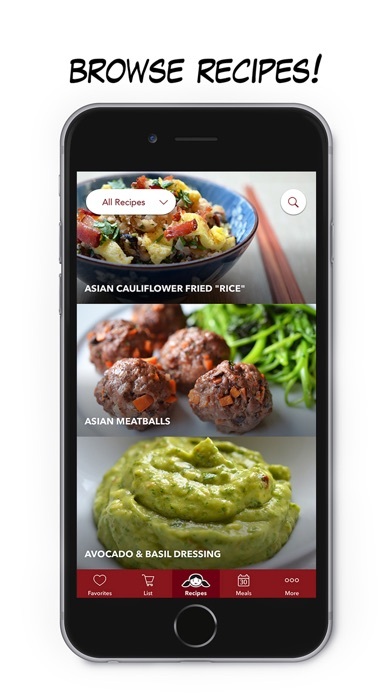 This app has categories that organize its recipes to fit the eating style you're looking for. It's easy to add ingredients to a shopping list and to follow along with the recipes. Trust me, you WILL be happy with this app. So nice to have a trusted Paleo specific recipe app!! I paid $5.99 for this app just so I could get the Paleo Brocolli Bagna Cauda recipe and guess what...right! It wasn't in the recipe repertoire. So, for that reason this app didn't work for me. I rate this app with "1" star only because it wouldn't allow me to rate it with "0"
Great app, worth every penny. I've already cooked numerous recipes from this app. It makes cooking and eating truly nomtastic! Your money is better spent elsewhere. The pictures are nice but there are not very many recipes and most of them are different flavored meatballs. There are only 3 meals in my app. The Whole30 is blank. Can I have a refund? I could not be more pleased with this app. Fantastic, original recipes and great functionality. Thank you! Michelle makes paleo easy!!! Even if you aren't paleo, these recipes are great and easy to prepare. I have suggested the app and cookbook to many of my friends. So happy it's on iPhone now too!!!!! I tried to find a recipe with salmon in it, and found there is not a single recipe with salmon. I would imagine salmon is the paleo list? Have it on my iPad and now my iPhone. Beautiful with great info! Are NEW recipes ever added to this app?! Disappointed there isn't a Pressure Cooker / Instant Pot category. The recipe authors loves her Instant Pot and has plenty of related recipes on her website, and the only reason I bought this app was because I like the Instant Pot recipes on her website and thought I could easily access a whole bunch of Instant Pot recipes under one category in the app. Turned out I would have to search for them manually, which is quite inconvenient. Even if I were to mark all Pressure Cooker / Instant Pot recipes as favourites I would still have to search manually from time to time in order to see the newly added ones. I look forward to upgrading my rating once this problem is solved, thank you. This app is simple, clean, and easy to use! It has tons of recipes and beautiful pictures! I use this app all the time and love it! Sadly, it's crashing before I can open it now! Boo! This app was really great when I first downloaded it and then when the update happened all of the recipes disappeared & all of my saved "favorites" were wiped. Now there are 5 new recipes and that's pretty much all. Without content there's really no point to this app at all. And I feel betrayed by the now empty "favorites" tab. Boo! I love the pictures and recipes, but wish there were more. There needs to be more updates so that the app stays current with the wonderful blog. It almost seems counter productive to not just open the blog in the browser instead of using the app. I absolutely love the website though, and recommend it to everyone interested in the paleo diet. I just bought this, opened it last night and favorited some recipes. This morning I was going to use one of those recipes but the app won't open. Not sure how to get help with this. Paid $6 for the app and used to love it. Upgraded my phone and now everything is gone. Fix it. I love Michelle Tam with all my grateful heart! I've never spent more than $0.99 on an app so I admit I was hesitant. Best money I've ever spent. EVER. We've ate a strict paleo diet for over six years and I get bored. This app was a game changer. Baking chicken thighs literally changed my life for the better. Everything I make I like better than the last. Won a contest at work with her salsa. She is cooking for a real family... like me! I need meals not treats and desserts I can find online all day. Food that feeds. Buy this app! There's a reason this app has won awards: its design is above and beyond other cooking app experiences and really becomes a paragon of post-iOS 7 design. If you do end up falling in love with the included recipes like I have, you'll be thankful for such a well designed daily reference. Must buy for any paleo eater or design lover. I love this app. It's beautiful and easy to navigate. I purchased it because my youngest daughter needs to be gluten free. There are many interesting recipes and I have not made anything from this app that I did not enjoy. It is definitely worth the price. One of my all time favorite apps! Easy to use, with outstanding pictures and step by step directions with format choices. Recipes are excellent. 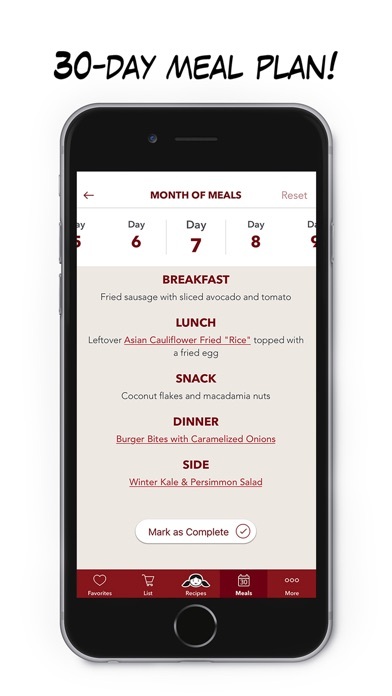 Whether you follow a Paleo diet or just want to make healthier choices, this app will not disappoint. This is a "10 star" app!!! I bought this app a couple years ago and it is completely non functional. I bought a new iPad Pro a month ago and have not been able to open it on the newest iOS on it since. Please update your app. This is ridiculous for the amount of money I paid. I have a few cooking apps on my iPhone, but nom nom paleo is the only one that I actually use. I've tried a dozen out of the app's 140 (and growing) recipes, and have gotten nothing but accolades from family and friends. Also, the photos are great for figuring out if your prep work looks right. My favorite recipes? Crispy slow-roasted duck legs and cracklin chicken. I love these recipes. My favorite is Curry Turkey Bites. It is a delicious way to make ground turkey taste really good. I line the cooked bites up on a cookie sheet and freeze them and then put them in a freezer container. Then I have a tasty source of protein to easily defrost for a quick meal. For $5, I expected a full collaboration of the nomnom recipes. Funny thing is, since buying this app, thinking I'd use it, I have had to go into the recipe index from the website on everything I've looked for! It remains on my app list only because it was $5 and I hope it gets updated! Come on Mrs. Tam! Updated, and STILL keeps crashing!! Crashes upon app startup. I love the recipes. And the app is easy to navigate but my only negative would be that the app doesn't continue to update with new recipes. And some of the ingredients are not easy to find or very expensive. I love the step-by-step instructions, equipment needed to use, ingredients and the fact that you can make a shopping list for you. Love having this app while grocery shopping or anytime I don’t know what to make. I can only see the 3 recipes that show up when I first open the app. When I tried to search for recipes none shows up. So disappointing. Every recipe I have tried I love. Nice to have her recipes and ingredient lists on my phone when shopping. Also love her cookbooks. With my son allergic to gluten and dairy, her recipes have been a revelation. Love this app! Had a tech problem but support got with me in a couple of hours (great time for a Friday night). Updates recipes pretty darn regularly (every few weeks) but everything happens in app, so you won't necessarily get an app update when the recipes update. Well worth the $. This is my favorite app.... EVER! Michelle has the best recipes and she has the best instructions. I love the simplicity and lay out of this app. Michelle is so cool and she oozes knowledge about all things good and health. She's that person in your life that you want to be around because you always learn something new from them! I love you Michelle! I cannot wait for your second cookbook! Oh and by the way... who in the world would give this app one star????? One of my all time favorite places to go for great food ideas. Love the app, and especially love the recipes! Don't buy the app-- just look on her website. There are far more recipes for free on the website than on the app. Love Nom Nom! Love the cookbook! Disappointed in the contents of the app. Great app but blog has more recipes! It is a well thought out app and easy to use BUT it does not have as many recipes as the blog! Clean, crisp, clear, concise on all fronts: app layout, design, user experience, recipe instructions and of course, the photography. The quality of this app is next level. I highly recommend this beautiful app as you can tell it's a labor of love for Michelle & Henry. Ps, I came to Nom2 as an I-pot user but dig the Paleo and Whole 30 element too, although I'm not a strict adherent. I just love the approach to healthy eating. Worth every penny to support this voice, their passion project and wonderful family. Big ups to the boys on the podcast! I've never paid more than $2 for an app but I loved Michelle's website so much I thought I would spring the extra dough (haha) to get her app on my iPad. Great decision. I use at least 2 recipes a week from this fun app. Easy directions, great photos, creative ideas to sneak healthy in to our delicious dinners for the family. Did the whole 30 program last month and the recipe choices were easy to supplement through this app. I now subscribe to her emails! I never review anything but I had to with this one. I love cooking but I need a recipe to follow and I have never seen a website or an app make it as easy as this one! Beautiful pictures, step by step instructions, and even the specific measurements are listed on each step! I don't need to go back and forth between the ingredient list and the cooking directions. So awesome. The recipes are amazing as usual. The issue is that the app stopped working. Is there anyway it will update/be fixed soon. This was one of the first things I used to start my party on Paleo. Since then I've finished a whole30 and cook at home so much more. Absolutely love this app. I subscribed to the blog and was excited when her cookbook came out at Costco a few years back. This app has her cookbook recipes and I can take it anywhere...like when visiting family across the country. Too easy. We especially adore the Dukkah, we put it on everything. My brother in law (lives on chicken nuggets and Hawaiian Punch) enjoyed the Brussels sprout chips...they're always gone quickly. You don't need an instant pot to reproduce these recipes...but it certainly cuts your time down significantly. Happy eating! This app (and all of Michelle's recipes in her cookbook) have saved my life, no kidding! I was scared to do the Whole 30 and/or go Paleo but I've never cooked such easy and delicious meals in my life, Paleo or not! My kids and husband ask for her foods specifically. I'm eating Kalua pig and cabbage now as I'm writing this review! I love the soups especially - so easy and fast and healthy! I will be honest, I was a little hesitant about spending $5.99 on a recipe app. However I love all of NomNom Paleo recipes and wanted to support the family behind them. Plus, everything is delicious!! I really enjoyed seeing all the pictures as I added by ingredients! sometimes I miss steps or lose track of ingredients and the pictures really helped. The one thing that would make this five stars is having a category for instant pot. I love my instant pot and I love NomNom's recipes for instant pot so it just makes sense. Keep deliciousness coming!! I'm a big fan. When I saw you had an app I had to get it! Love having the recipes handy. Thank you! Where has this app been all my life?!?! It's fantastic!! I really like this app and although it seems like nothing new is ever added to it, I'm more bummed that it doesn't work anymore. There are no recipes. Can we fix this please!?!? I love this app because it inspires me to cook healthy & nourishing food. Better yet? The recipes are super simple and there's a photo for EVERY step! And the recipes are DELICIOUS! Thank you from a grateful mama! I love the website Nom Nom Paleo, and finally bought the app after a year of hedging. The recipes are great! I love having them handy while grocery shopping. What bugs me is the step-by-step instructions for lots of the recipes. I would LOVE an option to see the whole list of steps at a glance. I love Michelle, but I don't need to see her rubbing salt on meat or pouring things into a blender. Takes forever to get through a recipe that way! Very helpful during Whole30. Have found many favorites through the app. I find it more convenient than going out to the website. Awesome app! Very informative, step by step pictures, SO MANY recipes! Easy to use. Whole30 section available. If you ever have any problems with it or want all the newest recipes, simply remove the app and reinstall. Easy! Very happy with it and tell all my paleo/W30 friends about it. We're not Paleo but LOVE this app! My family is not paleo but we do try to cook with real ingredients and mostly healthy. My family was hesitant to try some of the recipes but they've loved them all! I appreciate the pictures and the step by step instructions. I'm not an amazing cook but I can follow instructions. Love this app and will be purchasing the books soon! Love having all the tasty recipes on hand, especially to remind me of ingredients while I'm shopping. Imagine my dismay upon opening it the other day and finding all the recipes gone! Easy fix: delete the app and reload from the App Store. Happy Paleo! Please rescue me with an update. These recipes are the best but now the app crashes on launch. Help! Aside from recent issues I have loved it for a while. Update: a reinstall of the app fixed the issue. Please keep it updated though. I love this app, especially the Whole30 recipes. This app and the books have opened up a whole new world of possibilities for me. I've been into fitness and nutrition for years and have been eating the same boring bland foods when I start a training program. Love the app and all the available recipes. The functionality to add ingredients to your list from the recipe page is a huge plus! I discovered Michelle and Nomnom during my first whole30. Her recipes are easy to follow and delish. The app is user friendly and well organized. I had a problem when I got a new phone, I emailed thru the app and Michelle got right back to me with the fix. My favorites are slow cooker kalua pork, crispy skin salmon, spicy tuna cakes, curried broccoli soup, and my all favorite...Is Emergency protien. Thank you very much. When I bought the app there were so many recipes and I used the app often. Where did they go?! I've had this app for a number of years. I love it. 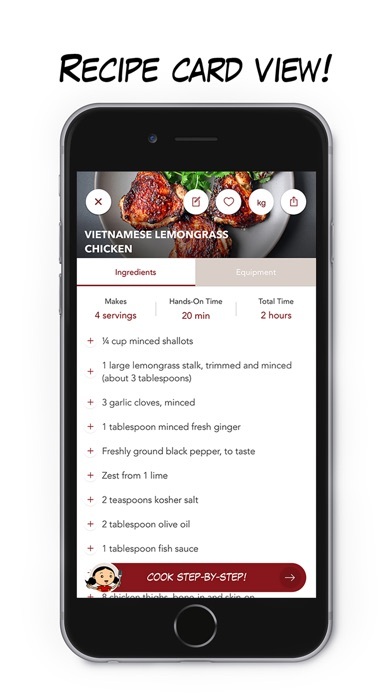 I like the flavor profiles that are found in the recipes and the ease of using the recipes in the app. I was excited to find that the recipes demoed on Facebook or magically appearing in this app. How cool is that. App always works and is updated fairly consistently. Screens are easy to navigate and the recipe instructions are thoughtfully presented. Love the "favorite" features and the ability to create a shopping list. Nom nom paleos recipes are always a hit in my home! I can count on 2 hands the number of reviews I have ever written but I had to chime in about how much I love this app. It is very user friendly and useful! I have made some of the recipies and they have all turned out very yummy! I would be interested in buying another from Nom Nom Paleo that only has instant pot recipes (hint, hint). Great app when it works. Crashes immediately every time on new iPhone X. I hope they are working on a fix. Love this app! Love the recipes and that they are updated. I also appreciate how the screen stays on while working in a recipe which is so convenient! I’ve cooked a majority of the recipes and they are all great. Nom Nom seems to have the same palette as my husband and I. What’s great is the cookbook still evolving. I open it up and occasionally find new recipes. How cool is that! An amazing app and so fun to browse! Love this app so much. So thoughtfully constructed and easy to use. Love the shopping list feature and the amazing photos of step-by-step that are for real people with normal kitchens. Her sense of humor shines through and I just adore cooking her recipes!! Also nice that you can send recipes via email even to those without the app. Excellent app. Easy to follow. I like the step by step recipes with measurements of ingredients. I love this app, and Michelle Tam's recipes are yummy. She adds new recipes too, so it is not boring but I still have my favorites like Kahlua Pig. Took recipes away...and now they’re back! Updating my review bc it was just an issue where I needed to delete and reload the app and voila! All my fave recipes are back! Always my go to for a good meal. ———————————————————— Used to LOVE this app but so many recipes were taken off. Now you need to go to the blog to grab a recipe. Why not offer same recipes that are on the blog in the app? Update: After update NomNom is one of my favorite apps again! Great app when it works. Crashes immediately every time on new iPhone X. I hope they are working on a fix. I love Nom Nom Paleo and I love this app! The recipes are fantastic. I love all the instant pot recipes! When I’m at a loss for what to make for dinner, I like to open the app and get inspired! Great flavors, packed with umami! Simple and delicious! 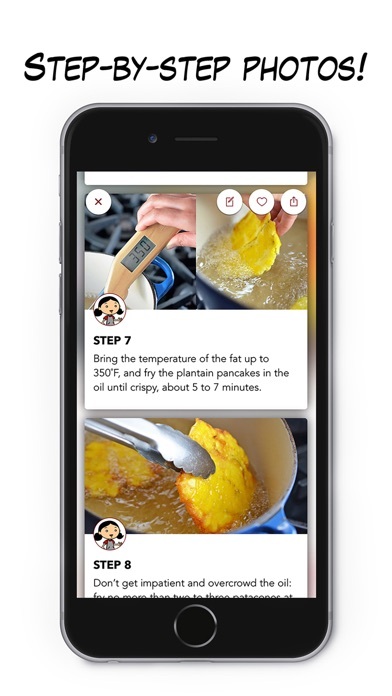 This app is the best recipe app ever! I even have the Ready or Not cookbook because I love how there are images for each steps. The best recipe app ever. Step by step pictures with the listed ingredients and amount below each picture. She even updates the app with new recipes. Love Nom Nom Paleo.